”Speak Out London” – an initiative to create diversity in the archives! Speak Out London – Diversity City is an initiative of the London Metropolitan Archives (LMA), funded by the Heritage Lottery Fund, to collect and create a special memory archives around London’s LGBTQ history. LMA’s work is an inspiring example of how archival institutions can work to reach out to groups that are underrepresented in the archives. 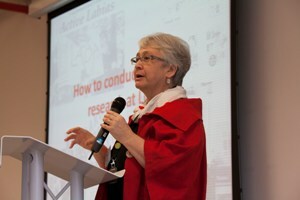 Jan Pimblett is Principal Development Officer at the London Metropolitan Archives (City of London Corporation) and responsible for Learning and Education Programmes at the LMA. Jan manages the creation and delivery of activities for schools, university students, teachers, community groups, families and adult learners through talks, conferences special events and long term Projects.